File photo of Dr Bonello Dupuis used in an interview with The Sunday Times last December. Former minister George Bonello Dupuis has passed away, aged 82. Dr Bonello Dupuis served as Minister of Finance after the 1987 elections and as Minister of Economic Services between 1992 and 1995. He entered politics with the Christian Workers' Party in 1966 and was first elected under the PN ticket in 1971. He was returned to Parliament in the 1976, 1981, 1987 and 1992 elections. After leaving the House he served as Maltese High Commissioner to London. Dr Bonello Dupuis also served for many years as PN treasurer and will be remembered by many for his good humour and his love of football. In a recent interview with The Sunday Times he criticised the behaviour of "disgruntled Nationalists" and said he wanted to help the Prime Minister in a time of need, and teach a lesson to hot-headed Nationalists who "grouse" over losing their posts. Condolences were expressed by the Nationalist and Labour Parties, as well as Alternattiva Demokratika. 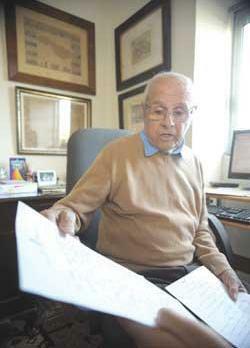 The PN described Dr Bonello Dupuis as the architect of modern economy.